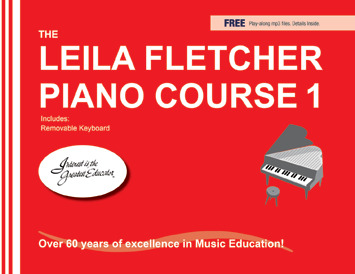 **Please note that Leila Fletcher Piano Course Book 1 CD is no longer available. Free play-along audio files are available for download for customers (information inside books). Leila Fletcher Piano Course Book 1 is an on-staff Middle C approach to piano lessons. Fletcher included and understood the need for rote before note teaching, as well as the philosophy of teaching from the known to the unknown. The musical and attractive repertoire includes familiar tunes, as well as teacher duets. Students progress quickly with clear keyboard cues, simple language, progress pages, check lists, attractive artwork, appealing lyrics and much more.